Though better than the tiny old Samurai, this is still not a good choice for everyday driving, even in 4-door form. 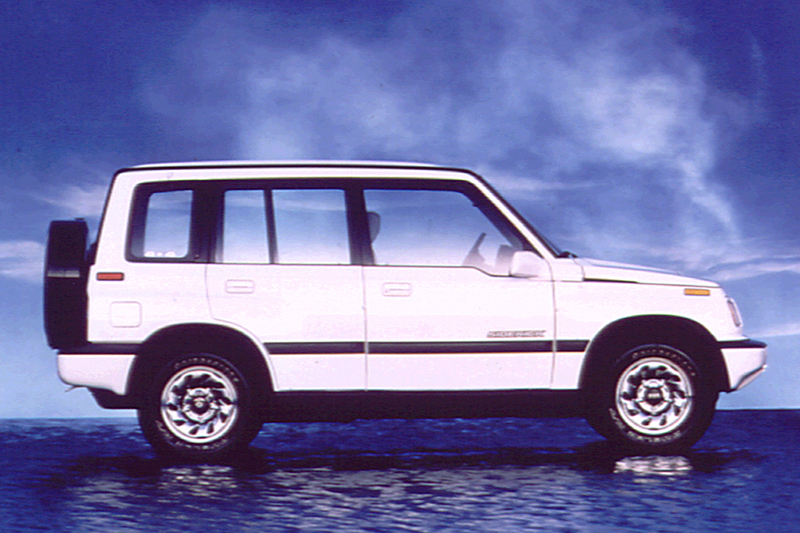 Suzuki launched its compact 4-wheel-drive sport-utility vehicle in 1989, adding a 2-wheel-drive companion for 1990. Geo also sold a version called Tracker. Sidekicks were powered by a 1.6-liter engine that made 80 horsepower. The lineup included a base JS, available only as a soft-top convertible with 2WD; plus more expensive JX and JLX editions, equipped with on-demand 4WD and either a soft top or hardtop. A 5-speed manual transmission was standard, and a 3-speed automatic transmission was optional. 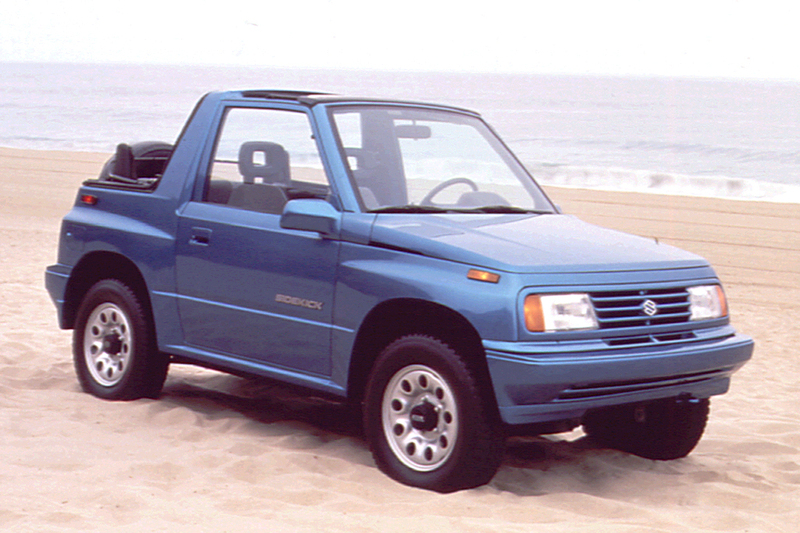 A 4-door hardtop Sidekick arrived in ’91, joining the soft-top 2-door models. Riding a wheelbase 11 inches longer than the 2-door’s, bodies measured 16 inches longer overall. Four-door Sidekicks came in base JX and upscale JLX trim. All 4-door models used the 80-horsepower engine with a standard 5-speed manual gearbox, on-demand 4-wheel drive, and new antilock rear brakes. A 2-place folding rear seat was standard on the JLX and optional on the JX. Four-door Sidekicks earned a power boost, adopting a 95-horsepower engine with dual-overhead camshafts. The midlevel JL 4WD convertible was dropped, leaving only two 2-door models, with the 80-horsepower engine. 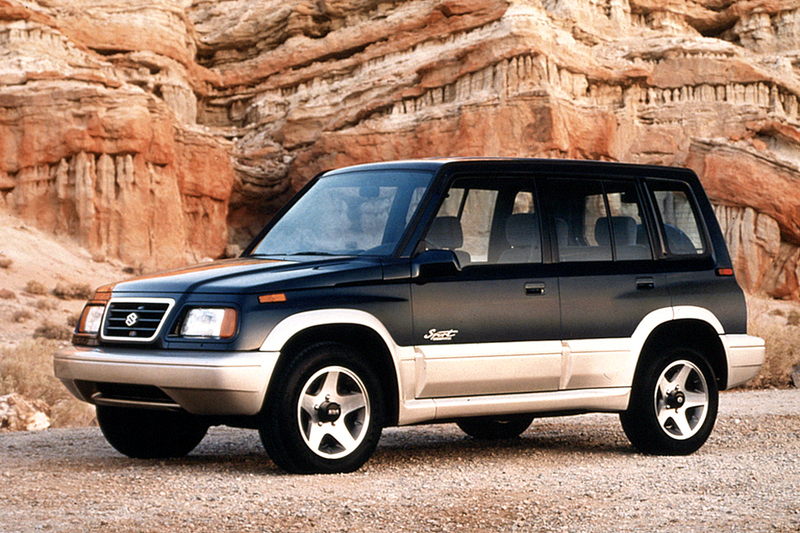 Equipped with 4-wheel drive and new automatic-locking front hubs, 4-door Sidekicks came in JX or top-line JLX trim. A 2-wheel-drive JS 4-door arrived during the 1992 model year. A 4-speed automatic transmission now was installed in 4-door models as an option, but the 3-speed unit hung on for 4WD 2-doors. Except for a few trim changes, Sidekicks showed no appreciable change for 1993. Sidekicks gained an antitheft alarm, tilt steering column, and center high-mounted stoplamp. Two-door JX convertibles got the 95-horsepower engine this year. All two-doors gained a new convertible top with zip-out plastic side windows. 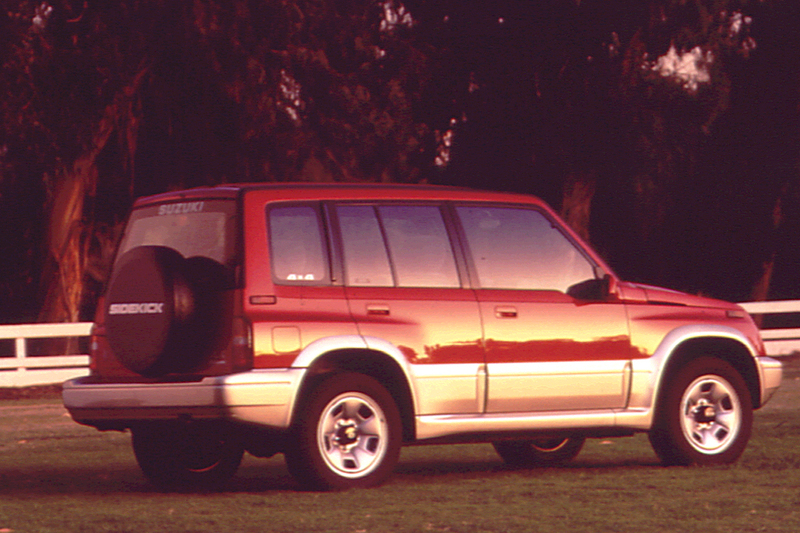 Sidekicks added dual airbags in 1996, with 4-wheel antilock braking a new option. The new Sidekick Sport got a more potent engine: a 1.8-liter, making 120 horsepower. All other Sidekicks held the 95-horsepower engine. Offered in JX and JLX trim, Sport models had a longer nose, fender flares, 2-tone paint, 16-inch tires (instead of 14s), and a wider stance. Four-wheel antilock brakes that worked in both 2WD and 4WD joined the option list. A new price-leader 2-wheel-drive JX Sport wagon joined the lineup. Automatic-locking front hubs were standard on the Sport JLX; other models had manual-locking hubs. 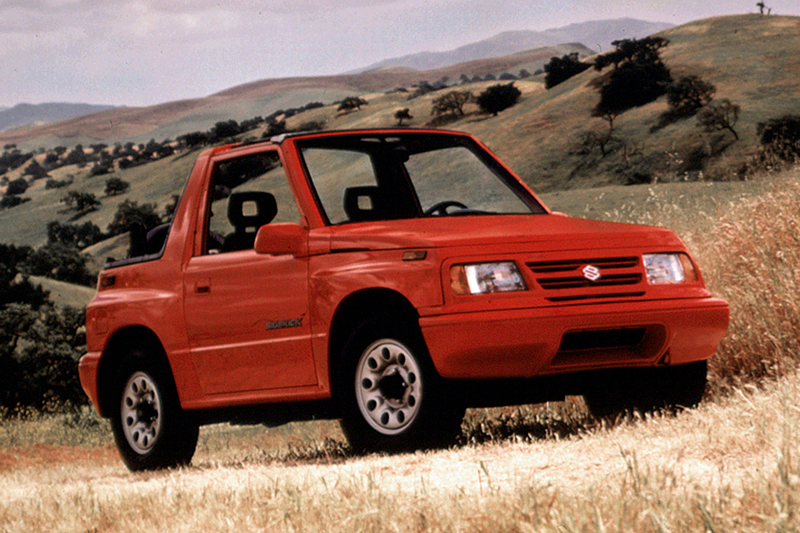 No changes were made for ’98 in anticipation of an all-new ’99 Sidekick, which would be called the Vitara. Initial Sidekicks, and all later 2-wheel-drive models, came with an 80-horsepower 1.6-liter 4-cylinder engine. Four-door models got a dual-overhead-cam version in 1992, making 95 horsepower. A 5-speed manual transmission was standard on all models; 3-speed automatic available on 4WD 2-doors, and 4-speed automatic optional on 4-door Sidekicks. A 1.8-liter engine arrived in 1996, for the Sidekick Sport. Acceleration with 80-horsepower engine is on the leisurely side, and the power boost in 1992 does not help much. The Sport model’s larger engine finally offers acceptable performance. That 1.8-liter 4-cylinder works well with the 4-speed automatic transmission. A late-model wagon with manual shift averaged 25.3 mpg, though automatic dropped the figure to a so-so 21.4 mpg. However, even the latest Sidekick engines growl loudly under throttle. Wind and road noise are abundant at highway speeds, too. Reasonably stable in corners and on the highway, Sidekick suffers a somewhat stiff and jiggly ride on rough surfaces. Four-door models endure less choppiness, credited to their longer wheelbase, but they’re not that much more comfortable overall. Tall and narrow, Sidekicks must be driven with care through turns. Sidekick’s 4-wheel-drive system is not for use on dry pavement. Head room is plentiful up front, but the rear bench seat holds only two adults, for 4-passenger capacity. Worse yet, it’s hard, with little leg space when the front seats are all the way aft–though space is adequate otherwise. In the Sidekick’s narrow cabin, doors sit close to the seats, leaving little outside shoulder room. Cargo space is best in the 4-door, with its swing-open rear door and fold-down back seat. Description: Front-seatbelt button can break and pieces can fall inside. Description: The right rear and left axle-shaft housing tubes were improperly welded and can fracture, resulting in separation of the wheel assembly which could impede vehicle control and/or increase stopping distance. Description: Fuel tank can puncture during rear-end collision. Description: Mounting bolts that attach upper end of front struts to vehicle body could break, causing loss of control.